In his State-of-the-State address, the governor made the case for an ambitious carbon tax. Gov Jay Inslee on Tuesday delivered an impassioned plea for lawmakers to enact a tax on carbon pollution that would enable the state to step up its fight against the damaging effects of climate change. Inslee devoted almost half of his State of the State address to arguing for action against what he described as “an existential threat” to the health of individuals, businesses and the environment. In his speech to a joint session of the Legislature, Inslee also called on lawmakers to finish the job on McCleary by using budget reserves to ensure the state is paying its share of basic education by the next school year as demanded by the state Supreme Court. The court estimated the price tag of full compliance is around $950 million. Inslee has said he would replenish those reserves with money collected in the first two years of the carbon tax. The governor also urged lawmakers to bolster funding for the state’s mental health system and its efforts to assist the homeless and those battling addiction to opiates. He pressed for passage of a number of Democrat initiatives including a bill to increase voter participation by allowing registration on Election Day, banning of gun modification devices known as bump stocks and eliminating the death penalty. And while the governor insisted lawmakers send a capital budget to his desk for signing, he notably made no mention of the ongoing dispute on water policy triggered by the Supreme Court’s Hirst decision. Republican lawmakers have refused to vote on the construction budget until there’s agreement on how certain private wells are permitted. The lack of mention of Hirst, along with the carbon tax, caught the attention of Republican lawmakers. Inslee’s speech came shortly after details of his carbon tax proposal were released. Under bills introduced Tuesday in the Senate and House, the state would impose a tax of $20 per metric ton of pollution-causing carbon emissions starting July 1, 2019. The tax would rise by 3.5 percent plus inflation each year and there would be no cap. It would generate an estimated $1.6 billion for the 2019-21 budget, most of which would go into reserves. Nearly $1.8 billion would be generated in the 2021-23 cycle with half to be spent on efforts to reduce greenhouse gas emissions, such as programs to expand opportunities for renewable energy at both homes and utilities, and research of clean energy technology. Another 35 percent would go into flood management and stormwater infrastructure, and would also be used to reduce risks of wildfires. Consumers could feel the effect in many ways. Estimates from the governor’s office are that the carbon tax could drive gasoline prices up 18 cents a gallon and also push up the cost of natural gas and electricity. A number of environmental organizations issued statements supporting a carbon tax proposal. Association of Washington Business President Kris Johnson issued one, raising concerns but not outright opposition. “The end result of the governor’s carbon tax proposal would be higher costs for energy to heat homes, fuel to drive to work and higher prices for natural gas that has helped fuel industries while lowering emissions,” he said. Those added costs would erode the state’s global competitiveness, he said. This is the newest attempt by Inslee to get a carbon tax passed. Thus far the concept has failed to gain significant traction in either the House or Senate in his tenure. A year ago the Democratic governor proposed a tax of $25 per metric ton of carbon emissions starting in 2018 that he estimated could bring in nearly $2 billion a year for education, transportation and clean energy projects. But the proposal never received a vote in the Democrat-controlled House or Republican-led Senate. Nor did the carbon tax make it into the school funding proposals put forth by House Democrats or Senate Republicans. Inslee insisted in his speech that the idea of putting a price on carbon is gaining support this year because the effects of climate change on Washington are clearly getting worse. And the rest of the world, as well as neighboring states, are pursuing the approach. Jerry Cornfield: 360-352-8623; jcornfield@heraldnet.com. Twitter: @dospueblos. Announcement comes in wake of Prop. 1 loss last November. In-person candidate filing starts May 13. 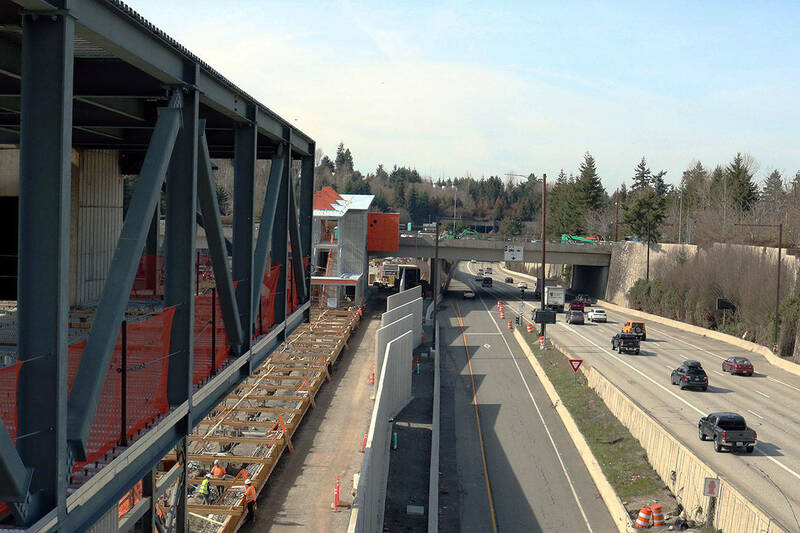 Sound Transit crews celebrated the 50 percent completion of East Link this month. Police blotter for March 29 - April 3. Police blotter for Feb. 22-March 27. Canvassers will provide free temporary licenses for unlicensed pets. Many address the need to replace aging infrastructure, especially at waterfront parks. The annual service day helps organizations who help Eastside communities experiencing poverty and abuse.